Six celebrities offer unprecedented access to their private lives and personal crises as they undergo intensive therapy with one of the UK’s most dynamic specialists, Mandy Saligari. Those featured include Princess Diana's former butler Paul Burrell and Anthea Turner. In a bid to understand who each celebrity really is, Mandy explores every aspect of their pasts: troubled childhoods and love affairs, infidelity and divorce, abuse and addiction, obsessions with fame and media courtship, financial strife and career catastrophe, the brutality of having - and losing - it all. Filmed via a fixed camera rig, this series combines the privileged intimacy of the therapy room, with interviews from closest family and friends, Celebrities: In Therapy reveals the UK’s best known celebrities as never before. Former butler to the Royal Family Paul Burrell dragged himself from a northern mining town to the heart of the royal family, first serving under the Queen - before finding his place as Princess Diana's self proclaimed 'Rock' following her controversial divorce from Prince Charles. But when Diana tragically died, Paul was left heartbroken and exposed. Forgotten by the Royals, Paul was accused of peddaling her secrets - and worse - in a bid to keep his place in the royal household. 2017 marks 20 years since Diana's death. Paul recently divorced the mother of his two grown up sons, and after coming out as gay, found happiness with his new husband Graham Cooper. But the ghost of the Princess still haunts him. In a bid to finally move forward, Paul is turning to Mandy Saligari, one of the UK's most dynamic therapist's. Paul enters therapy determined to send the message that he's a new man - finally comfortable in his own skin now that he has found true love. But the message doesn't ring true to Mandy as Paul continually refers to his past life at the Palace - and struggles to differentiate between his own family and humble beginnings - and the glamour and prestige of the life he fought his way into with the Royals. In therapy Paul admits that his sexuality 'the gay monster' dominated his childhood and teenage years. He reveals his mother singled him out from his two brothers, protected him from his disapproving father and convinced him he deserved a better life, far from his coal mining roots - but to Mandy this signals the beginning of a pattern of Paul not being true to himself, leaving her unsure if she should believe the stories he shares with her - of life inside the palace walls and of his close relationship with 'the people's princess' - leaving a question mark over the royal stories Paul has previously shared with the rest of the world. Therapy is not easy for Paul, as he struggles to let go of the Paul Burrell façade the ‘public’ has come to expect of him, rather than the off-duty Paul his husband Graham fell in love with. He knows he has to fully embrace the private man he really is, but can he really let go of the past – and the celebrity it has given him? Former television golden girl Anthea Turner was once the highest paid female presenter on British TV. But the dream turned sour when Anthea embarked on an affair with a married man, Grant Bovey. The inevitable media storm tarnished Anthea’s squeaky clean image – made worse after their star studded wedding appeared to be ‘sponsored’ by a famous chocolate bar. Incapable of processing the media backlash, Anthea retreated from the public eye, and focused on her life as a housewife and stepmother to Bovey’s three daughters. But now divorced, Anthea’s lavish lifestyle and the celebrity it afforded her is a distant memory. Determined to rebuild her confidence and her career, Anthea is turning to the UK’s most dynamic therapist, Mandy Saligari. Anthea begins therapy a shadow of her former self – quiet and fragile – and admits that her divorce, finalized just days before, has left her feeling exposed and vulnerable. She recalls a happy childhood, but her dyslexia haunted her – and gave her a determination which drove her to become the queen of British TV. But through therapy it becomes clear that the tragic death of her younger sister Ruth – and her inability to process this as an 18-year old girl, has forced Anthea to protect herself from her own emotions, to devastating impact. Anthea admits that despite rising to the heady heights of the UK’s highest paid television presenter, fame came at a high price - professional jealousy and intense media scrutiny, amidst which she, finally giving into her feelings, embarked on her ill-fated affair with property tycoon Bovey, whilst both of them were married. Mandy helps Anthea to see how the loss of the public admiration, and subsequently her career and ultimately the relationship with Bovey left Anthea with nothing to hide. Therapy is an intense but rewarding experience for Anthea – can Mandy help her she confront the impact of her losses to begin the new chapter she so desperately craves? 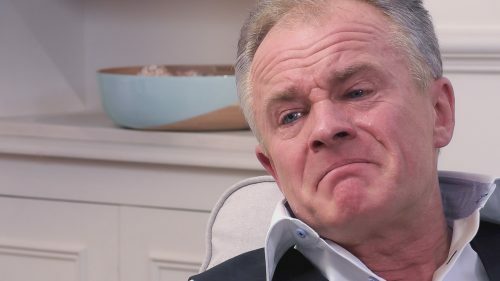 Once the king of Saturday night television, Bobby Davro entertained audiences of millions with his iconic impressions. Married to a beautiful woman and with three lovely daughters, Bobby lived the dream with a huge house and a troop of fast cars. But the illusion was shattered when Bobby’s marriage ended in a bitter divorce. With his comedy heyday behind him and still struggling to keep his personal life on track, Bobby is turning to Mandy Saligari, the UK’s most dynamic therapist. Bobby enters therapy as the man we knew from years of entertaining the masses –but as he quickly unravels into tears within minutes of the first session, Mandy realizes that Bobby hasn’t yet processed any of the emotions surrounding his divorce. Keen to explore why these feelings are still so raw, Mandy detects another problem beneath Bobby’s pain: alcohol. Bobby admits that he’s calmed his nerves with a glass of wine before the session and that he drinks everyday, but insists that he doesn’t have an addictive nature. Alarm bells begin to ring for Mandy. Throughout therapy, Bobby fights the idea that his drinking is a problem – and when Mandy suggests he consider going to an alcohol dependence meeting, Bobby resists. But Mandy has a breakthrough when the two discuss Bobby’s relationship with his father – who chose to focus on his eldest son’s golfing career – rather than Bobby’s own talent for performance. From an early age, Bobby looked elsewhere for reassurance. Therapy is emotional for Bobby – he’s torn between listening to Mandy and struggling to come to terms with his own image of someone who’s drinking is a problem. With emotions still raw, he’s admits that during the process he’s realized the slippery slope he’s on with booze – but can Bobby use his new understanding to finally move on and process his emotions without drink? Once the nation’s favourite Bad Girl, Claire King, captivated audiences of millions in her groundbreaking role as femme fatale Kim Tate in Emmerdale. In her heyday she married her co-star Peter Amory and the two became the media’s golden couple, gracing the covers of endless magazines as Claire scooped up best actress awards. But behind the scenes Claire’s marriage, career and finances hit the rocks. Now 54, Claire is turning to Mandy Saligari to regain the strength of confidence for which she was once so well known. Claire enters therapy at a good point in her life - a face-lift in her 40’s and her recent role in Coronation Street have put Claire back on the map, and a new relationship sees her more stable than ever. But despite her composed exterior Claire quickly dissolves into tears – confessing to Mandy that since the death of her best friend, she’s found it impossible to truly open up. Mandy discovers Claire has never really dealt with the losses of her past, some of them dating back as far as early childhood. Shedding her normally tough exterior during therapy, Claire expresses that her privileged childhood was truly idyllic until the age of 7, when her parents decided to send her to boarding school – something Mandy quickly identifies as an early source of sorrow for Claire. After a childhood playing by the rules, Claire rebelled with her best friend and embraced a punk rock lifestyle. Acting pulled her away from the groupie music scene, Claire confesses that her marriage to Peter was blighted by his huge gambling debts and his infidelity – and left her childless, from which she sought solace in drink as a means to numbing her pain. Therapy is more challenging than Claire anticipates – she feels exposed but knows she must process her past to move forward – but can Mandy convince Claire to get in touch with her vulnerabilities to prevent her from repeating the mistakes of her past to finally find true happiness?